We have set up Execute Query on Google Groups to consolidate queries and issues as well as provide an indexed support forum and mailing list. Please visit us at http://groups.google.com/group/executequery. You can also continue to log your issues and requests directly here or from the feedback option in the application help menu. The latest version 4.4.2 has been posted up and is now ready for download. 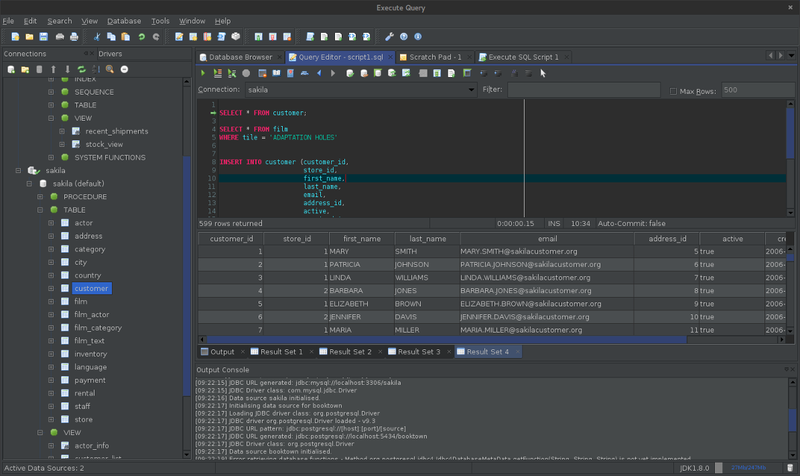 Version 4.4.2 continues the new dark theme as well as a number of new features including connections over SSH and editing data from the data browser tab as well as continuing to build on existing work such as SQL shortcuts feature for the Query Editor, result set exporter and SQL script executor, in addition to a number of bug fixes and tweaks. Click here to view the release notes and summary of changes. Thanks to all who were so prompt in their feedback with bug reports and comments. Reusable component libraries developed as a part of Execute Query as well as some other small utilities are now available for free download from underworldlabs.org. Execute Query is an operating system independent database utility written entirely in Java. 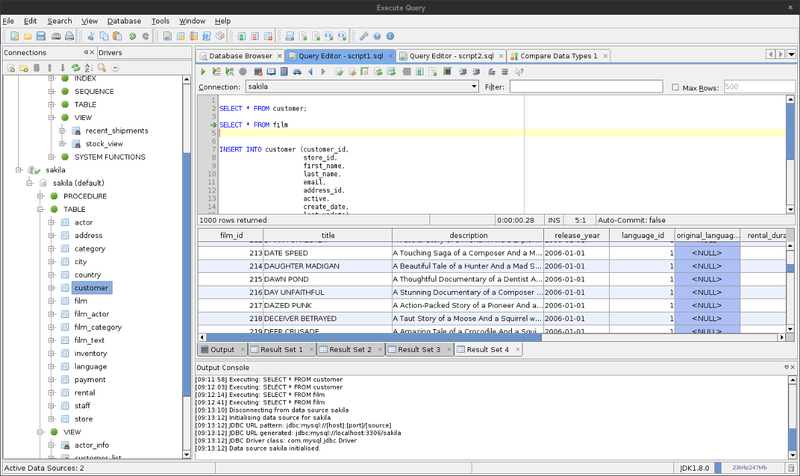 Using the flexibility provided by Java Database Connectivity (JDBC), Execute Query provides a simple way to interact with almost any database from simple queries to table creation and import/export of an entire schema's data. See Features for a list of some of the available tools. If you find this software useful and would like to say thanks, donations are gratefully received. This software was developed using IntelliJ IDEA who kindly provide Execute Query developers with free licenses, and Eclipse Java IDEs and jEdit on a Debian GNU/Linux system. ej-technologies GmbH have also kindly provided licenses for JProfiler. Execute Query has been tested under Windows, Linux, Solaris and Mac using Java Runtime Environment v1.7 - Java v1.7.0 (min) is recommended. If you do not have the required Java version please go to the Java website. Execute Query is very much a work in progress and is continually being extended and refined with new features and tools. Interests of contribution are welcome. Execute Query is available completely free of charge and will remain so under the GNU Public License.